Working together to promote better health and lower costs. A health plan in collaboration with our Arizona providers that focuses on patient-centered care. Dave Allazetta, CEO UnitedHealthcare Arizona/New Mexico, and Dr. David Hanekom, CEO Arizona Care Network, explain the unique alliance and the focus on delivering the best care for each individual and their individual needs. 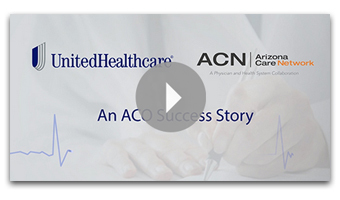 With UnitedHealthcare Navigate, members choose a Primary Care Physican (PCP) from Arizona Care Network (ACN). Navigate and Navigate Balanced plans offer varying levels of coverage and plan designs to give you choice and flexibility in offering solutions that work for customers and members. Access your personalized health care and benefits information at myuhc.comOpens a new window®. Get the most out of your plan with the security and guidance of a Primary Care Physician (PCP). Learn about your benefits and the many great services available to you, including your coverage options, choosing or changing your primary care physician, and the referral process.